... preparing for the flea market tomorrow! I had to take all the boxes and sacks down from the attick, with stuff I want to get rid off. There's a flea market in our village tomorrow, and me and my walking-friend Suzanne, have reserved a spot. We have to be there at 8.00 a.m.! The actual flea market is from 9.00 a.m. untill 3.00 p.m.! I hope we sell most of our stuff, because the money I'll earn is for the dolphintherapy for my son. I also want to sell some dolphins that I made myself (see daily something) and some other stuff (bracelets, t-shirts, cards) from Doc Dolphin Fund. I hope you sell lots of things and have fun. I LOVE to go to flea markets but on the other side of the tables as a browser! 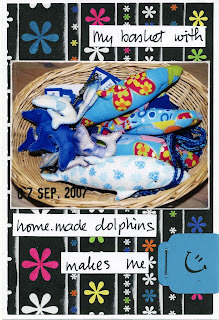 I noticed your dolphin goodies the other day and wondered about them. Where is the dolphin therapy located? I hope you are able to have the opportunity to do this for your son. Hoe was het op de rommelmarkt! ?